Who knew that the estimable Carl Allen, drummer in Wynton Marsalis’ ensembles, could play a Philly soul shuffle with the best of them? Or that saxophonist James Carter had a thing for 20s hot jazz? 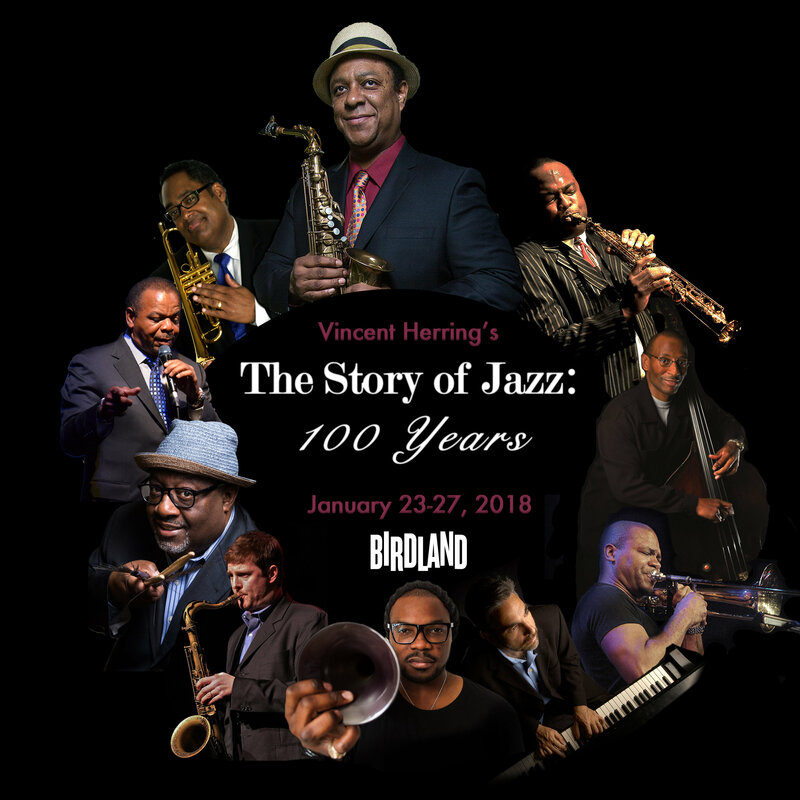 If he doesn’t, he sure fooled everybody last night as a member of alto saxophonist Vincent Herring’s ten-piece ensemble, who were playing the first night of their weeklong stand at Birdland. The concept, The Story of Jazz: 100 Years, is ambitious – sets continue nightly at 8:30 and 11 PM through Jan 27. In a marathon hour and a half onstage last night to open the stand, they made it from 1917 to the late 70s. On one hand, that’s not as much of a challenge for this particular hall of fame crew as it would be for a less seasoned cast. This is an allstar band to rival any other one, anywhere. Sharing the stage with Herring, Allen and Carter were Eric Alexander on tenor sax, Jon Faddis and Jeremy Pelt on trumpets, Robin Eubanks on trombone, Mike LeDonne on piano and organ, Kenny Davis on bass and Nicolas Bearde on vocals and also reading from a script that offered a surface overview of jazz history. Through the decade of the 60s, the group’s charts were fascinating; the playing was as sage and thrilling as you would expect from artists of this caliber. Herring and Alexander shared Coltrane riffs judiciously and soulfully. Faddis and Pelt threatened to pop valves, then shifted into resonant, peak-era Miles mode. Carter clearly saw this as a cutting contest, and he’d come to slay, whether mining unexpectedly low richness from his clarinet, spiraling and flurrying with his usual white-hot intensity on soprano sax, saving his most exhilarating volleys for his tenor sax. As this particular narrative acknowledged, jazz first bubbled up in the melting pot of New Orleans in the 1890s but didn’t reach critical mass until around World War 1 with Jelly Roll Morton and his contemporaries. The group began there, blazed through dixieland and then a balmy take of Summertime, sung with august restraint by Bearde. By now, it was obvious that this was going to be a greatest-hits survey. Basie got a nod, as did the Ellington band via a blistering charge through one machinegunning solo after another. Fats Waller’s Ain’t Misbehavin’ got a only slightly less boisterous doublespeed coda. Bearde particularly excelled with his post-opiated interpretation of Straighten Up and Fly Right as the band barreled and bounced behind him. The 50s, a decade the band spent plenty of time in and could have stayed in for even longer, were most vividly represented by Take Five and its balmy, unexpectedly plush chart, and So What, an apt vehicle for Pelt. For whatever reason, the group saved Caravan and its whirlwind of round-the-horn solos for the 60s. Was Eubanks going to get one, as a shout to Juan Tizol? Yes – he ended up playing it pretty close to the vest. They reinvented The Girl From Ipanema as a boogaloo: did anybody catch that wicked moment where Davis fired off a neat series of doublestops in response to a similarly slinky LeDonne organ phrase? Allen did. It was just as cool to hear them run a couple of impassioned verses of Les McCann’s protest-jazz anthem Compared to What. It was in the decade after that where the band lost focus and phoned it in. You would have, too, if you’d been onstage. These guys all have substantial individual catalogs, and they cut their teeth on the classics, so vamping their collective way through one cheesy 70s fusion hit after another seemed rote – and unfamiliar terrain. Has anyone in this ensemble ever had to fake their way through a Chuck Mangione number? Doubtful. At least they did the club’s theme song – Weather Report were responsible for that one. Did anybody notice? The staff did. Conventional wisdom among diehard jazz fans is that the 70s were a dead decade, and that’s far from true. This group could have had a ball with something by Ruben Blades, or Tito Puente – latin jazz was underrepresented in this particular set. An AACM interlude, like the group’s detours into dixieland and early bop, would have been appropriate. There’s got to be something by, say, Anthony Braxton or Henry Threadgill that’s translucent enough to resonate with the tourists. Devil’s advocate says that tourists have no idea who Braxton or Threadgill are. And that’s not true either – the Europeans often know them better than an American audience would. All this is not to criticize the band’s achievements last night – everybody is busy with their own projects, and there’s only so much time to come up with charts for a group this size. They’re there for the rest of the week for fans of history and pure adrenaline.